Description: Internet connected programmable control for central heating and hot water which can be operated using a smart device such as a mobile or a tablet. Why: Improve efficiency and reduce the amount of wasted heat by having better control. Allows the user to access their heating controls remotely should they not be at the property but need to adjust heating. Very useful for supporting a less abled person or should the homeowner have forgotten to turn the heating off and needs to control remotely. Who: Those that are conscious of heating bills or have an elderly or less abled family member who may be unable to control their heating. Description: Designer glass radiators offer ultra modern and aesthetically pleasing central heating improvements. Innovative, energy efficient, sensor controlled, easy to install and slim fit designs make the old traditional radiators a thing of the past. Why: The glass radiators are still unknown to some and these products could be of interest to homeowners who have a keen eye for interior design. The mirrored glass radiators are great in bathrooms and offer a space saving alternative to a mirror and towel radiator combo. Who: Those having a new bathroom installed or considering a bathroom refurb. Those that may have limited space and require a slim fit design. 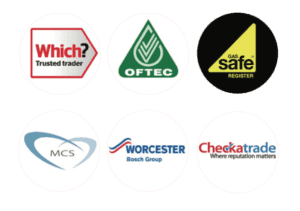 Description: We are a Worcester Bosch Platinum Accredited installer and specialise in finding the best boiler solution for the customer based on each individual case. Why: Heating and hot water contribute to over 80% of the average household’s energy consumption. Boilers which are over ten years old waste a lot of valuable energy, so replacing an old inefficient boiler will be one of the most effective ways to reduce energy bills. Replacing the boiler will save homeowners on their energy bills and help reduced their carbon footprint. Who: Customer with problematic or old inefficient boilers. Description: A premium boiler service, which includes safety checks and is undertaken by a gas safe registered engineer. Why: To help prolong the life and efficiency of a boiler by cleaning parts and inspecting for faulty components, which may need replacing to avoid future repair bills. A gas safety check is also undertaken to ensure there are no gas leaks or hazards potentially putting the home owner at serious risk. Who: Those concerned about gas safety, and those with families, tenants or less abled and elderly members for whom they care for. Those who would like to prolong the life of their boiler and ensure it is running at it’s optimum. Description: A power flush is done under high pressure, moving the sludge and enabling it to be filtered out. Why: This improves the circulation and effectiveness of the radiators. It also helps prevent nasty repair bills such as having to replace the boiler or its expensive parts (a heat exchanger for example). Who: Those with old systems, luke warm or poorly circulated radiators. Description: Combimate is a polyphosphate scale inhibitor. It is plumbed directly on the cold water supply to the property or appliance to protect the hot water system. Why: As mains water flows through the Combimate, the water comes into contact with Combiphos. The phosphate within Combiphos coats the inside of a home’s pipework, boiler heat exchanger and appliances, with a non-residual, microscopic, protective coating to prevent scale-causing minerals from accumulating and aggressive soft water from corroding the system and appliances. Who: Those in hard water areas or those with lime scale issues. Description: A Magnaclean is a central heating system filter which captures magnetite build-up within a system. Why: Magnetite is the official name of system sludge and over time this builds up in a central heating system. The main benefit of a MagnaClean is to improve the system’s efficiency. System sludge creates cold spots in radiators which will mean the radiators aren’t working to their potential. By removing these cold spots it will restore the system back to its original state. A MagnaClean will also protect the boiler and its components such as a heat exhanger. Who: Those who have boiler services and take care of their systems. Those in hard water areas or are susceptible to lime scale issues. Description: A cylinder should be checked annually to ensure that it is in good working order. Why: A service will help maintain the efficiency of a cylinder and reduce the risk of future repair bills due to a poorly maintained system. The pressure and temperature valves are checked together with an inspection for leaks and signs of wear and tear. Setting the incoming mains water and adjusted if necessary, plus cleaning of any filters or components. Who: Those having a boiler service should have their cylinder checked (if they have a cylinder) too, you’ll save money when combining a boiler and cylinder service. Description: Detects carbon monoxide and triggers alarm. Why: Protect you and your family from carbon monoxide poisoning. Who: Those who are safety conscious, have a family or care for elderly or the less abled. It is the law for landlords to have one installed for tennants. Description: A switch that isolates the mains water supply. Do you know how to turn off the water in your home incase of a leak? Why: Isolates the water supply at a flick of a switch. Who: Useful for landlords, elderly and the less abled. The switch can be installed in a convient location and is easy to switch off the mains water in case of an emergency (i.e not stiff valves). Description: Dualflow water softener will provide a constant stream of softened water. Why: Removes excess minerals from hard water with a special ionising process that uses salt water. Who: Those in hardwater areas or have hardwater issues. Click here to see terms and conditions. The 10% off only applies to our standard services and excludes anything that requires a quotation, such as installations. However, we do run special offers for installations, which includes our boiler scrappage incentive (£300 off for your old boiler). If you have any specific details that may assist us please feel free to use the section above. For example, if you're having a boiler service you can mention the type of boiler (Gas, Oil, LPG, Commerical or even the make and model).